PARSE is one of the new built-in conversion function introduced as a Part of Sql Server 2012. PARSE function converts the string expression to the requested data type. It tries it’s best to translate the string value to requested type but if it fails to translate then raises an exception. Important Note: This PARSE function is not a native Sql function, instead it is a .NET Framework Common Language Run-time dependent function. Then obviously it will have the performance overhead and also requires the presence of .NET CLR on the database Server. Continue to use the existing CAST and CONVERT functions wherever it is possible. Below example demonstrates how PARSE function tries it’s best convert the input string value to a specified data type even when the specified value is not in the correct format. This conversion fails as February month will not have 31st day. Error converting string value ‘2012/02/31’ into data type datetime using culture ”. Below PARSE function will fail to translate the date. Because the culture parameter specified is en-us, but the string value specified is not in US format. US Date format excepts month first instead of day and then day and year. 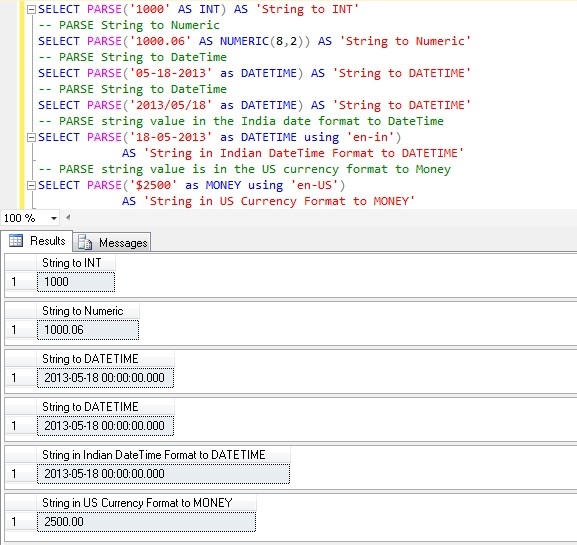 Error converting string value ’18-05-2013′ into data type datetime using culture ‘en-us’. Difference between PARSE and CONVERT function. Below example demonstrates the difference between PARSE and CONVERT function. PARSE function will successfully converts the string ‘Saturday, 08 June 2013’ to date time, but the CONVERT function fails to convert the same value. That is PARSE function tries it’s best to convert the input string value to the requested type, but CONVERT function requires the input string to be exact format no variations allowed. Thanks for this, proved very helpful for converting dates in the format “November 2011” to a valid date format. Thank you for your good article. Have a question. I’m wondering “performance overhead since new built-in functions using .NET CLR”. then what about performance as a “elapsed time” ? Should I use it even new built-in functions had performance overhead? You can use them. It will not have much considerable difference in the performance.